Today was Day #2 of Chocolate and Coconut Theme Weeks. 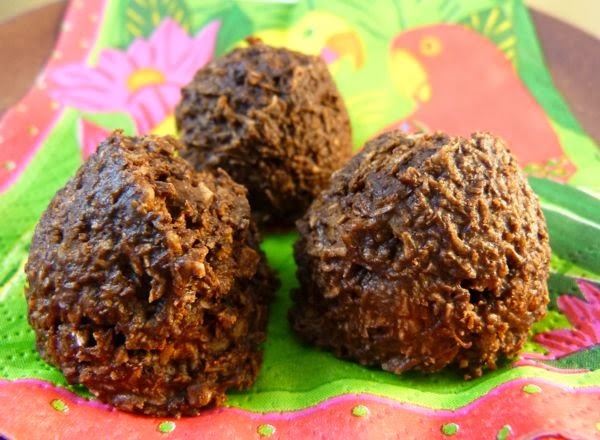 Coconut has become a popular choice for sweets and chocolate, especially in the raw and organic world. 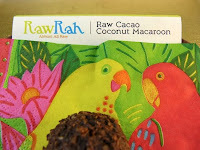 Today's package of 3 small Raw Cacao Coconut Macaroon(s) from RawRah (Thousand Oaks, CA) were tasty and slightly chewy. Many commercial coconut macaroons are sticky sweet. These were sweetened with shredded dried coconut and a hint of maple syrup, rather than sugar. They were satisfying in texture and flavor (enhanced by the raw cacao) without being too sweet. I'd rather savor quality ingredients than experience a sugar buzz. These raw cacao macaroons were produced by Joy Dupuis at RawRah. Thank you to Katy who passed these on to me!